Petite Star. Huge Statement. 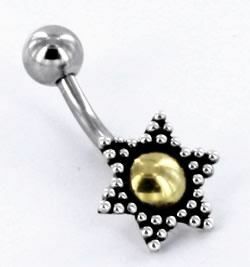 This little belly ring has a golden jewel that's surrounded by sterling silver granulations. Perfect paired with a black bikini on the beach or dressed up for a night out, this Golden Petite ring can make any outfit pop! To top off your jewelry ensemble, check out for these matching Petite Star Earrings.